Redesigned lower bulkhead with new anti-roll bar mounting areas, fits front R, rear L. CNC-machined from premium Swiss 7075 T6 aluminum and have been designed to provide the lightest and strongest possible support framework for the car. 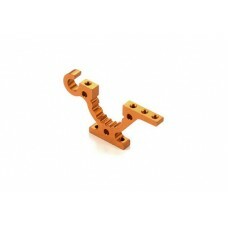 Color anodized in a distinctive orange color. (Note: Color may vary slightly between products.) XRAY’s legendary attention to detail is noticeable in all the precisely chamfered edges.